Booking travel through TripActions? 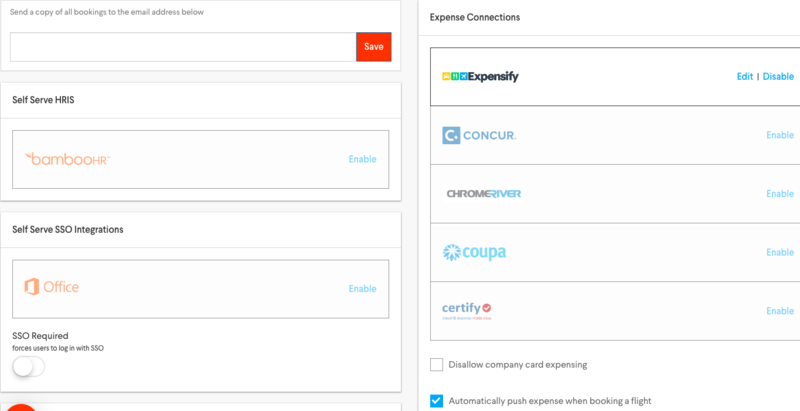 Link your Expensify and TripActions accounts to automatically send flight receipts to Expensify for easy reporting. To get a demo of TripActions, sign up here. 1. Sign in at tripactions.com. 2. Click on your profile in the upper right corner. 3. Select “Integrations” from the drop-down menu. 4. In the Expensify box, click the “Enable” link. 5. Uncheck the box to “Disallow company card expensing”. 6. Check the box to “Automatically push expense when booking a flight”. Moving forward, any flights you book through TripActions will automatically be added to an expense report in Expensify. 1. Click "Edit" next to Expensify. 2. Enter the email address you want the receipts to go to. Follow these instructions to send pre-paid hotel receipts to Expensify. This also works for flights that were booked prior to setting up the integration outlined above. Click the “Trips” tab in Trip Actions. Select the trip or hotel that you'd like to expense. Click the “Expense to Expensify” link at the bottom of the page.